Got some exercise in yesterday. Going back to using the music while doing T'ai Chi is helping because I'm paying more attention to that than how many 'reps' I'm doing. Jahb chae tonight! 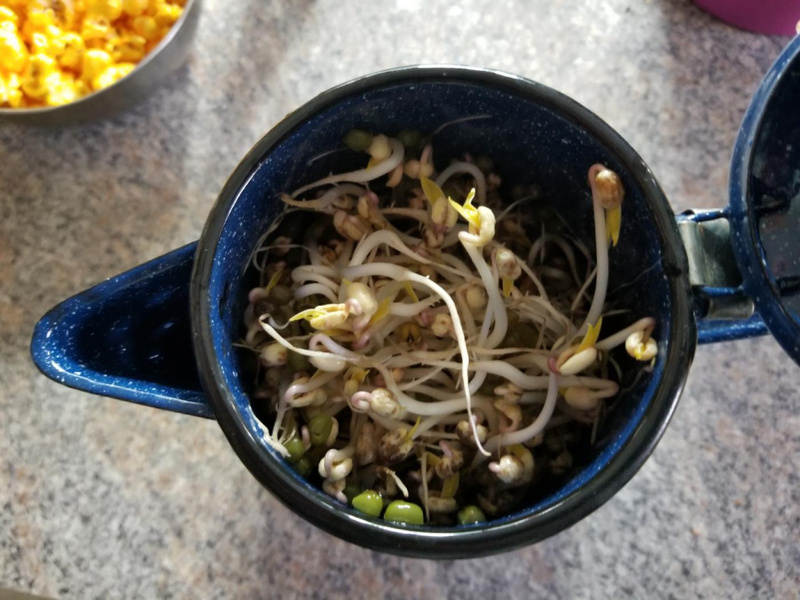 I need to sprout stuff more often. It's simple and cheap and a good way to add nutrition to all kinds of stuff. I weighed and bagged portions of junk food we stupidly bought yesterday. That was an eye opener! I always knew it was bad, but it was a good visual of how little of that crap I can eat before going completely off the rails. I sealed up the potato chip bag with the FS so it can't be easily opened to grab a handful and put it in the freezer for some other week. The party mix Husby bought is so bad a serving is about half a handful. But of course, who would stop there? Not worth even starting. I think I need to start posting to this thread daily in the evening. I get up every day with good plans and good intentions and then something happens. If I post what I actually did instead of what I intend, maybe I'll be able to shame myself into doing better, knowing I will have to post failures. I will start this on Monday. On the plus side, I made dip with HM ranch dressing and dip mix and FF plain yogurt. I like it, and it's 0 pts for WW. I snack on lots more fresh veggies if I can have dip, so this should be a big help to me. It will be good on lots of foods to add flavor and creaminess, too. Well day 30 of no eating sweet treats. This has been very hard, I am usually okay until evening and then the cravings start. Eating frozen grapes in the evenings helps some. I still haven't decided if this will end for me tomorrow or if I want to do another month. Part of me is dying to eat some sweets but the other part of me knows that it will turn into a 3 day sweet bingefest! The good news is that my weight is about where I want it, another reason to keep sweets at bay. Well done, Rabbit! I know how difficult that is. Last time I went on a sugar fast that was the only change I made and I lost 13 pounds. Congrats on getting to your goal. I haven't weighed in yet but my first goal will be to get down to the next five pound mark. I have about 14 stupidly regained pounds to lose before I get back to VFT. Based on yesterday the short term goal is probably around 4 pounds. I should lose that pretty fast since the past week has been a salt-fest here. I will check in later to be accountable for today's actions or lack thereof. I'm trying to eat better and one improvement is eating a lighter meal in the evening. So now my main/largest meal of the day is lunch. I found some granola bars that are starting to become my sweet of choice. Granted, I still have an issue with sweets (especially ice cream) but at least the granola bars have oats and fruit in them. I call them sweets because of all the sugar/honey involved in them. I just need to wean myself off them as well. I also have a bag of chocolates at home that I didn't inhale within days of buying them. At least I'm not really interested in the more sugary cereals. I actually am at the point where I prefer Raisin Bran or the Berry Special K cereals these days. And burgers and fries are losing their appeal as well. I fell asleep before I got around to posting last night. I now have one blue dot day in a row, meaning I tracked my food and stayed within points. It's a start. I also TMed 20 minutes. Not much, but it boosted my activity. I drank lots of water, too. 1.1 pounds lost overnight, so 2.8 to goal. I hope to make that by the end of the week, but I obviously regained plenty of fat along with fluid, so I'm not counting on it. Aiming for blue dot 2 today. This is the place to hold yourself accountable so here goes.........I binged on sweets yesterday. Yup, March was over and I ate my fill of sweets. I was feeling sick all night! No wonder after not having it for a month, my body couldn't handle all that sugar. renmerc, wanted to say, my mom eats like that, largest meal for lunch and a lighter dinner. She keeps herself at her goal weight that way, it works for her. Still tracking and losing here, even with the soy sauce I put on the absolutely delicious shrimp and pea pods we had for supper last night. WW, of course. I have 1 pound to go to get to my first mini goal, so it's been a good week. My weeks start on Mondays for weight loss purposes, so I have 4 days to dump that pound. It's incentive. Well I called it, my sweet binge turned into a 3 day party. The crap is gone and I am back to eating normally. I know I replied to this thread, but must have tapped the wrong thing because I don't see it now. .1 pound to go to my first mini goal. It's a start. Got back into the garden on Sunday. So the gardening exercise has begun. I'm starting off slowly after a winter of being lazy in the exercise department.